Each week, Big Issues focuses on a newly released comic-book issue of significance. This week, it’s Detective Comics #13. Written by John Layman (Chew, Puffed) and drawn by Jason Fabok (The Dark Knight, Justice League International Annual) and Andy Clarke (2000 AD, Batman And Robin), it’s an all-ages issue that revitalizes the book with a sense of humor that doesn’t distract from the drama. Batman currently headlines five different comic books in the New 52, varying wildly in quality from the riveting Batman to the ridiculous The Dark Knight. The character’s flagship title, Detective Comics, never managed to rise above mediocrity under the direction of writer/penciller Tony Daniel, but that all changes with Detectives Comics #13. It sounded like a perfect fit when DC announced that Chew writer John Layman would be taking over the title, and his first issue proves that he’s the right man to revitalize the book that gave DC its name. With his creator-owned series, Layman has shown a remarkable skill for incorporating comedy into high-stakes drama, and that’s a major boon for Detective Comics, a book that has been sorely missing the fun as of late. In just two panels at the beginning of the issue, Detective Comics becomes instantly more enjoyable, thanks to Layman’s sense of humor: “On Tuesday, Bruce Wayne donated $350,000 to the Gotham City Orthodontic Association,” Batman narrates. “So come Friday night, I don’t feel too bad about this,” he continues, a close-up panel showing his fist slamming into the left side of a man’s face. It’s a funny line, but Batman is completely serious. He actually sees his donations as Bruce Wayne as compensation for any sort of physical harm he performs as Batman, which is a smart way of taking Batman’s attitude and using it to create comedy. The endlessly grim tone of Tony Daniel’s run on the title got old fast, and Layman takes an approach that’s refreshingly all-ages without losing any intensity. Other than a bit of gun violence in the back-up story, there isn’t anything gruesome that would make parents wary about giving this book to their children. Nobody’s getting his face ripped off and nailed to a wall in this issue. But while this first part is all-ages-appropriate, future issues might not be; readers of Chew know that Layman can do gruesome if he wants to. Hopefully he’ll stick to more traditional superhero violence on this title rather than going for shock and awe. More importantly (again, especially for young readers), the story is easy to follow and not mired in continuity. All a new reader needs to know to dive into this story is that Bruce Wayne is Batman and that the Penguin is a bad guy. It helps to know who Alfred and Nightwing are, but the story makes it pretty clear they’re Batman’s allies, and that’s all that really needs to be established. While Batman is out filling Gotham hospitals, the Penguin has put a hit out on Bruce Wayne, who has just donated a considerable amount to a new children’s wing of the Neville Community Center. A power-hungry Oswald Cobblepot wants to wipe Bruce Wayne and his family name off of Gotham City, building up Cobblepot influence while diminishing that of Gotham’s other founding families. It’s not necessarily the most original plot, but it gives Batman the opportunity to solve a mystery that’s directly related to his alter ego. And Bruce is definitely the mask in Layman’s story: Notice that in that opening line, Bruce Wayne is referred to as a separate person while Batman is the “I.” Bruce Wayne helps strengthen Gotham with his money; Batman does it with his fists and his mind, and he seems to prefer the latter. As he investigates a string of seemingly unrelated bank robberies, Batman actually does some detective work to figure out that someone is trying to keep him distracted from something else. He intimidates a thug by knowing his name and rap sheet, proving that sometimes a little preparation can work better than punching. After discovering that each of the buildings being robbed uses the same security system, he’s able to discern future targets and have Nightwing take care of the rest. Batman stops one of the assassins outside of the community center and uncovers the plot to kill Bruce Wayne, but shows up at the opening anyway, where a ninja with a flaming sword appears for the main story’s cliffhanger. 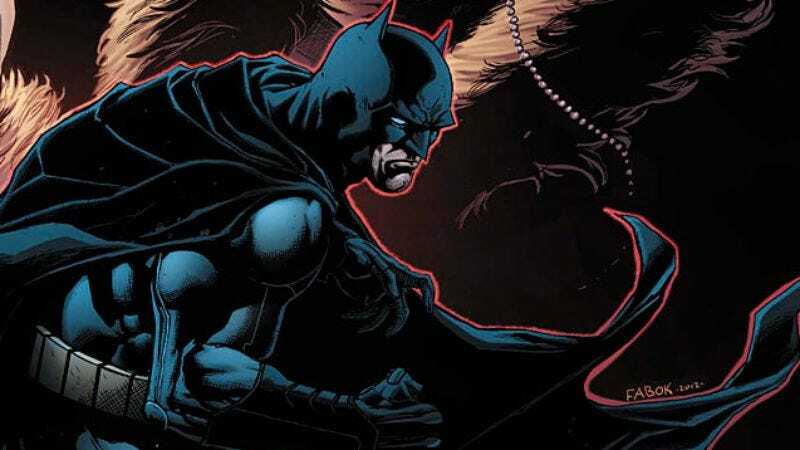 This first part demonstrates Layman’s ability to write a captivating Dark Knight, and the next issue will reveal how the writer does with Bruce Wayne. If the costume-less back-up story is any indication, it will be fantastic. “IQ Test” teams Layman with artist Andy Clarke for a story following Penguin’s right-hand man Ogilvy as he trains a new recruit to Penguin’s gang. While the main story is strong, the eight-page back-up is where Layman truly excels. Revealing how Penguin got his hands on the codes for those security systems, the short story shows how a smart criminal gets by in Gotham without grabbing Batman’s attention. Ogilvy is the teacher as he recalls his past run-ins with the Bat, building up the character’s mythical status as he tries to humble his cocky accomplice. Layman emphasizes the ignorance of Gotham’s criminal element when it comes to Batman, and earlier in the main story, one of the Penguin’s hired assassins has the opportunity to deliver a headshot to the hero, but doesn’t take it because he’s told Batman’s bulletproof. Ogilvy has similar ideas about the Dark Knight, painting him as an unstoppable, inevitable force of nature that all Gotham criminals will eventually meet. Therefore, it’s best not to grab his attention by doing things like killing innocent security guards. It’s not often that a henchman is actually smart, and this back-up does great work fleshing out a character that could have easily been set dressing. If Layman can bring this kind of depth to a seemingly unimportant player, imagine what he can do with the rich cast of characters in the Batman mythos. Jason Fabok has quickly risen through the ranks of DC artists, and after gaining high-profile Batman and Justice League International Annual assignments, he’s finally been put on a regular title. When he was pinch-hitting for David Finch on The Dark Knight, Fabok was essentially aping Finch’s style, which means great action sequences and nicely rendered environments with costumed characters, but repetitive facial expressions and body types, especially for female characters. Since leaving that title, Fabok has become more comfortable with his own style, which is looser than Finch’s, allowing for more variation in the characters. His Penguin is a bit more handsome than usual, but it fits with Oswald Cobblepot’s New 52 status as Gotham’s kingpin; besides, he’s still short and fat. Fabok draws a badass Batman (the opening two-page spread is stunning), and his style is well-suited to Layman’s more traditional superhero main story. Fabok wouldn’t be appropriate for the talking-heads back-up, and Andy Clarke’s intensely detailed artwork works better for a story featuring more grounded characters. And with Eisner Award-nominated Jock drawing next month’s back-up before Clarke returns in December, DC is making sure readers get an extra artistic bang for their buck. Scott Snyder and Greg Capullo’s Batman may be getting most of the attention right now, but Layman, Fabok, and Clarke’s first issue brings Detective Comics closer to flagship status than it has been in over a year.